Mason District Hospital’s imaging department offers a full range of diagnostic services for your convenience in a compassionate setting, close to home. All of these services are offered through using state-of-the-art equipment and are provided by highly-trained, professional technologists. Another way Mason District Hospital is High-Tech, High-Touch. For more information concerning our services please contact our friendly staff at (309) 543-8596. The Radiology Department is happy to deliver CT enhanced clinical data by capturing clear and more precise images than previously possible with our new Siemens multi detector scanner. Our exceptional dedication to care means offering you the most positive CT scanning experience possible. Every aspect of your examination, from the moment you schedule an appointment to the results, is meticulously overseen by our devoted professionals. We offer Digital Mammography. Digital Mammography uses a low dose x-ray system to create diagnostic images. It also allows for availability of images on computers and immediate transmission of images between physician offices. Digital Mammography provides a rapid and accurate technique for diagnosing cancer and other potential abnormalities. Mammograms are critical for early detection of breast cancer. Because of this the US Department of Health and Human Services, American Cancer Society, American Medical Association, and the American College of Radiology all agree that mammograms should be done every year beginning at age 40. We have highly skilled mammographers, all certified by The American Registry of Radiologic Technologists in Mammography. All technologists are committed to their patients, for both comfort and accurate diagnosis. One of its greatest uses is as a fast and easy method for physicians to view and diagnose broken bones. However our highly trained radiology staff also use many other x-ray techniques to help diagnose a variety of problems. Ultrasound or sonography uses high frequency sound waves. These sound waves create echoes based on the density of objects they come in contact with. Yes. Ultrasound is a non-invasive technique so there aren’t any syringes, scalpels, or other cutting devices. It also doesn’t use ionizing radiation like an x-ray does, so patients and babies aren’t exposed to harmful radiation. Osteoporosis is a gradual thinning and weakening of bones, which can lead to bone fractures. Over 28 million Americans, 80% of whom are women, have or are at risk of developing this condition. Since osteoporosis is often referred to as a “silent disease”, many are less likely to find out they have it until they suffer a painful bone fracture. There is a safe and easy test that can asses your risk of developing osteoporosis. The patient lies on a large examination table that is padded and comfortable. Data is entered into a computer by the densitometrist and then the equipment scans the spine and hip. The exam takes approximately 25 minutes. Results from this test will assist your doctor in determining if you are at risk for osteoporosis. Although osteoporosis is a disease of mature adults, (not just women), prevention begins in the growing years when optimal calcium intake is vital to the growing skeleton. Nuclear Medicine – Single photon emission computed tomography (SPECT) imaging is performed, as well as whole body, standard planar radionuclide procedures and gated cardiac imaging with stress testing. 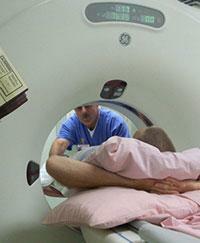 Thyroid imaging and treatments are also performed in this department. Nuclear medicine is a noninvasive and usually painless medical test that uses a very small amount of radioactive material to diagnose or treat disease and other abnormalities within the body. Depending on what type of exam you are undergoing, the radioactive material is injected into a vein, swallowed by mouth or inhaled in a gas and eventually collects in the area of your body being examined, where it gives off energy in the form gamma rays. The energy is detected by the gamma camera that works together with a computer to produce special pictures offering details on both the structure and function or organs and other internal body parts. We have highly skilled nuclear technologists certified by both The American Registry of Radiologic Technologists in Nuclear Medicine and the Nuclear Medicine Technology Certification Board. MRI (Magnetic Resonance Imaging) scans are done using magnetism, radio waves, and a computer. The MRI unit is a large magnetic tube that a patient can slide into. When a magnetic field is created the protons on hydrogen atoms line up. At this point radio waves can be used to make the protons spin. The spinning motion creates varying signals that are interpreted by a computer and turned into an image. An MRI scan is a very accurate way to view the structure of organs, joints, tissue, bones, and much more. In joint cooperation with a Mobile Imaging services we are able to offer MRI services on-site using a mobile high frequency/high field, 1.5 tesla MRI. Clinical Radiologists, S.C. (CRSC), is a premier radiology group, based in Springfield, Illinois. With more than 55 board certified physicians covering all radiology sub-specialties, CRSC is one of the largest and most progressive radiology groups in Illinois. CRSC provides service to patients in a variety of settings, including — tertiary, community, and critical access hospitals; multispecialty and single specialty clinics as well as physician offices.